Ever since Schuyler Skaats Wheeler introduced the electric fan 127 years ago, there hasn't been much innovation in the field. The old adage "If it ain't broke, don't fix it" comes to mind. But who ever said it was perfect? Certainly not James Dyson, which leads us to the bladeless, nonbuffeting Air Multiplier. Air is pulled in through vents in the base and then pushed out by a hidden impeller over a circular airfoil-shaped ramp that runs inside the rim of the halo, creating an uninterrupted stream of cool air. 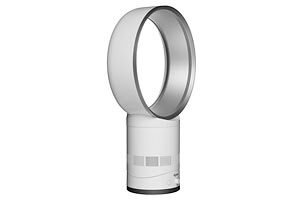 Because it's bladeless, the Air Multiplier is safer than conventional fans, and it retains normal functions like tilt, oscillation and speed control. It looks cooler too.